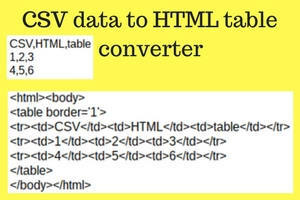 Convert CSV (comma seperated value) files into HTML Tables quickly online. Copy in the CSV and click Get Results button. HTML results appear in the lower text area and can be copied out. Use Notepad or a text editor to open your CSV file and copy the contents into the top text area box. Press Get Result button after completing copying in CSV file in to text area above. Copy and paste the lower table results into a text editor and save as a file name with .html extension. Or copy and paste table to /table section into an existing webpage code using an editor.